I feel sympathy for every animal lost,stranded or abandoned. They are not only pets they are a part of someones family..so sad. This picture is just so precious. A picture says a thousand words and I couldn’t show or tell others the fact that animals feel fear, pain, and emotions the way this one photo has done. To those of you out there who continue to choose to believe that animals run purely on instinct and are not sentient beings…..here is proof that you are wrong. 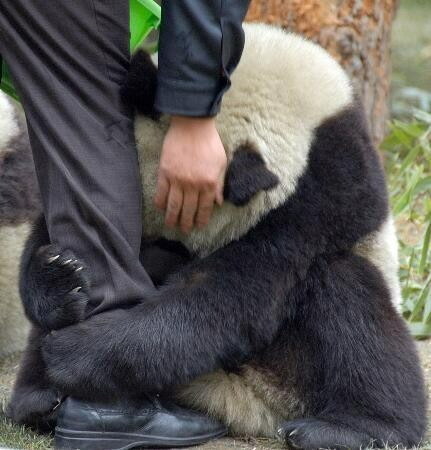 A picture does indeed say a thousand words, but this image is not of a frightened Panda following the earthquake in Japan. oh that is so cute! but i know that is so sad that every animal has lost thier home due to nature. so they do not know what to do so they try to come out and find help like people! i send my love for everyone and i pray for everyone and i am goin to get a prayline going for you guys out there. just keep your head held high god is with you all.